Yup, that would be the paintbrush and varnish. Life always manages to throw some unexpected curve balls and the latest one around here is about our gorgeous new labels. Due to some crossed signals with the label company, they put more varnish than we wanted on the labels. What this means is that while the ink goes on the labels okay, it also can be rubbed off by a determined person or simply by traveling the high seas of the mail. We discovered this after a week or so of sending a sprinkling of the new labels out into the world. In general, we are using the new labels as we run out of the old ones, but a distributor in Hong Kong asked to have her whole order in the new labels and we were so full of excitement about the labels that we proudly sent her order off with all new labels. Shortly thereafter we heard back from her that the writing on the labels had rubbed off onto the box lids in transit. This was exactly what we hoped was not going to happen. 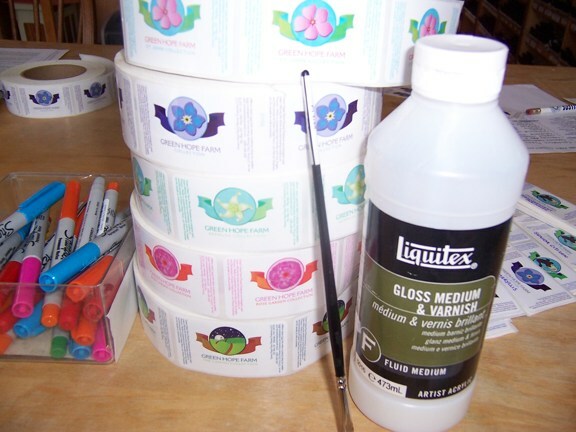 After a lot of research, we settled on solving the problem by varnishing every label after Lynn or me or Polly our new label queen writes the label. Blessedly I like mindless jobs, because varnishing labels certainly qualifies. But my main emotion is relief that we figured out a solution. While a few labels have gone out into the world without this varnish, from here on out everything will be protected and you will be able to sky dive in the Grand Canyon with your Essences in your pocket and the label will look as fresh and legible as the day it was written on. And yahoo for that!